Finding a private and comfy place to breastfeed is no problem when you have a nursing cover. They're marketed under all sorts of clever names, such as hooter hiders, but you can easily make one yourself in under an hour. This basic pattern features a clip on adjustable strap, and a strip of boning sewn in along the top hem. The boning allows a little peek-a-boo window for Mom. I found this very helpful for getting baby in position and latched on correctly. 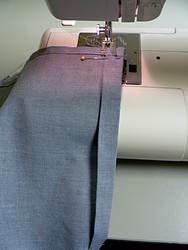 And it's easy to tip the hem down or press it out flat if you need more privacy. This easy breastfeeding cover pattern is the perfect companion gift for one of the baby sling patterns found here. Used together, a nursing cover and a baby sling create a mobile, modest, and hands free nursing combo. This combination of baby gear has saved my sanity several times, and both pieces fold down very small to fit inside a diaper bag or purse. There are many variations that you could add to this simple pattern. I have seen pockets sewn in at the bottom corners to hold nursing pads and pacifiers, as well as terry cloth inserts on the inside corners to wipe little mouths with. 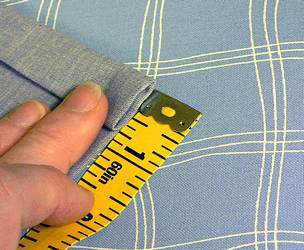 This simple pattern is a perfect sewing project for beginners. You can do it in under an hour! If you enjoy using your nursing cover, I recommend making two, so you'll have one to use while the other is washing. 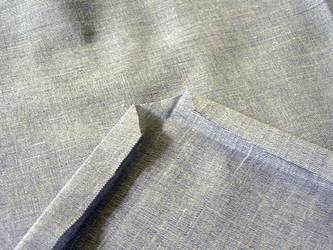 You may find this page helpful in selecting fabrics for your nursing cover. at any given chance. So you need one of these. "I used to laugh at nursing covers. I thought they were just a gimmick to get new mothers to buy yet another baby accessory. 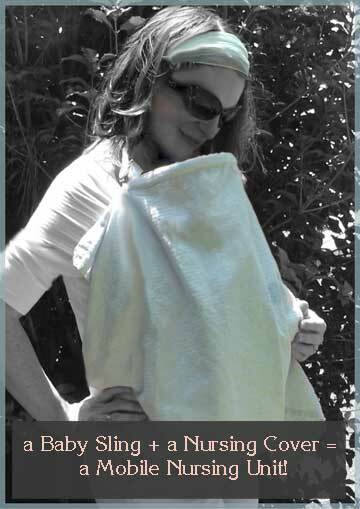 My baby blankets worked just fine for nursing privacy on the few occasions that we were in public. Then came the day that I met friends at the mall for lunch. I was nursing my baby, covered with a blanket as usual, when she suddenly decided that she'd like to be a part of the conversation. My little darling whipped the blanket off and exposed me...twice!!! I came home that day with a mission to make my own nursing cover. Thank you so much for this free pattern. I made two of them, and I can't imagine life without them!" *My local fabric store sells boning in a box, that they cut by the yard. 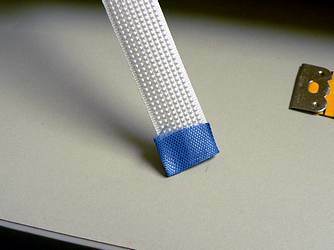 It is with the odd and end notions such as velcro by the yard. It's used in making fitted dress bodices and corsets...and nursing covers. 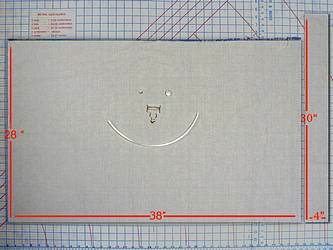 Cut the main panel of your cover. I like the standard 28" x 38" panel. But you may cut it any size you wish to suit your modesty preferences. 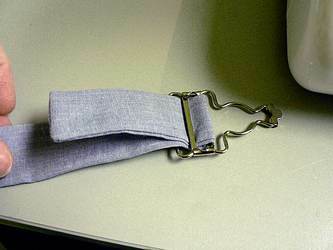 Cut the strap for the buckle size that you chose. Your package should tell you what strap size the buckle will fit. 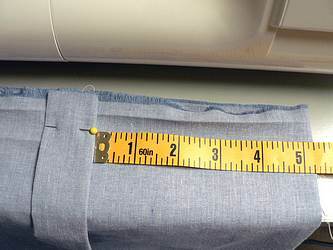 Double it, and then add an inch for seam allowance. My buckle is made for a 1 1/4" strap, so I cut a 3 1/2" x 30" piece of fabric for the strap. 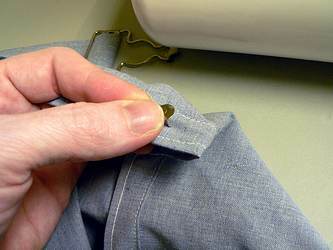 Fold strap in half along the length, but don't iron it. Stitch it along the length. middle of the strap as I am doing here...your choice. Side seam is easier...I don't know why I did the seam up the back. 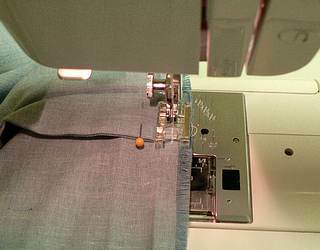 Trim the points of the sewn end closely at angles. 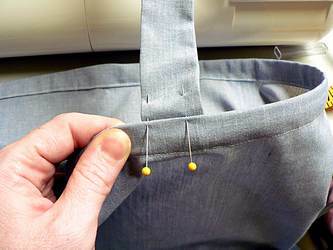 Poke in the stitched end of the strap to make a shallow little pocket. 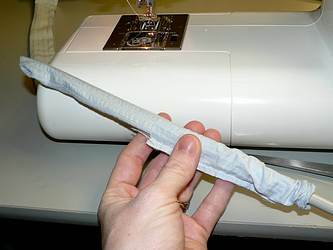 Poke the blunt end of a knitting needle into the pocket. Push it in to turn the tube right side out. 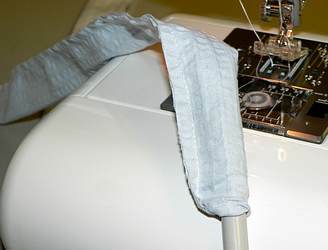 Next, we'll iron in the hems of the nursing cover panel. On the sides and bottom, fold edges in 1/4" and iron down. 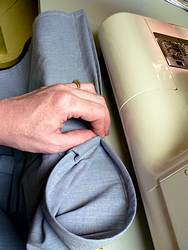 Fold them in again, creating a rolled hem and press well. 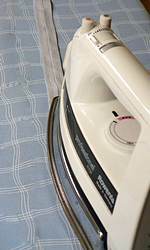 You'll be cutting off the point where the first set of ironing lines intersect. Cut the triangle of the corner off on both bottom corners only. Trimmed bottom corners should look like this. 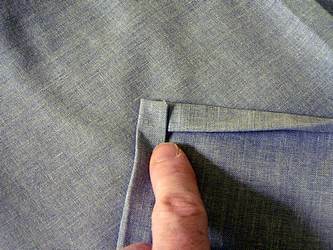 Folded, you will have nice, neat corners like this. Next, iron down 1/4" at the top of the nursing cover. 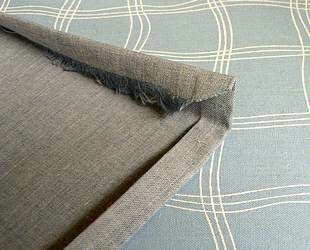 Then turn under a 3/4 inch deep hem and press down well. 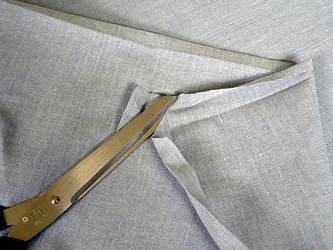 This hem will be the channel that will hold the boning. 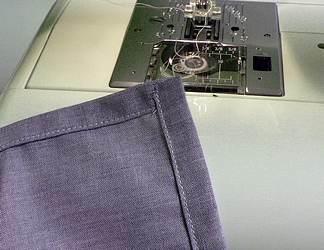 Turn your panel wrong side up, and begin stitching down your side hems. 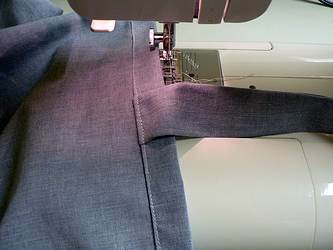 Start with the hem on the right. 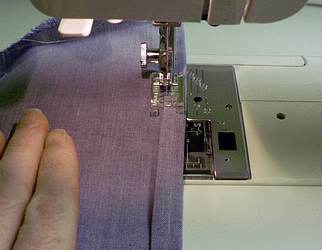 At the bottom, stop stitching at the bottom corner edge. 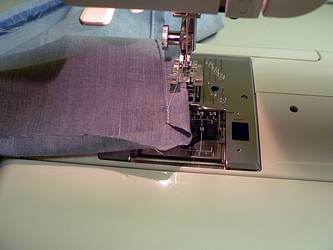 Fold up the bottom hem, and stitch into a neat corner. 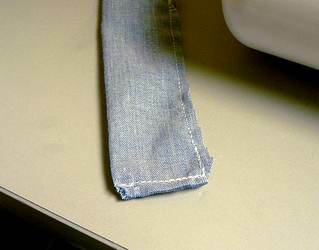 Hem all the way around the sides and bottom, but don't sew the top down yet. Now, turn your nursing cover right side out. Fold the nursing cover panel in half along the top hem. Measure back from the center fold to 5 1/4". Pinning the strap in place as shown. The raw edges of both strap and panel are lined up at the top. 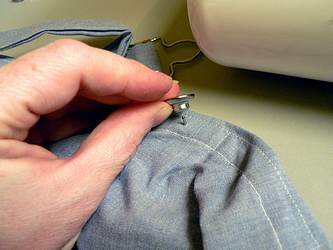 If your seam is centered on the strap, then pin the strap seam side up. So the right sides of the strap and the nursing cover are together. Stitch the strap in place close to the top edge of the panel. Glue ribbon on each end of the boning. Cut one inch of heavy ribbon, and glue 1/2" to the back. Put glue on the front and wrap around. Allow to dry. I like to use waterproof glue. Quick Grip in the green & yellow tube is my favorite. 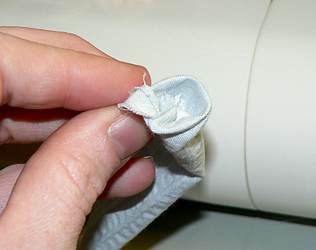 The ribbon helps to hold the stiff plastic ribbing in place during normal washing and wearing. the strap. 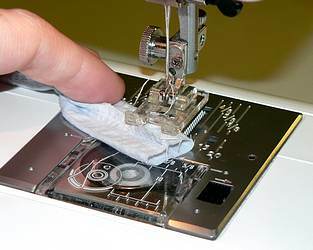 Fold it up as shown and stitch it in place*. 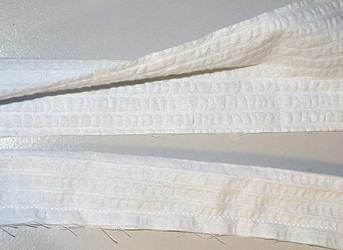 *When it's finished, the strap will be held in place by 3 seams, making it strong enough to hold up against the most determined little yanking hands. and top stitch along edge of the nursing cover. Now, insert boning into top channel. 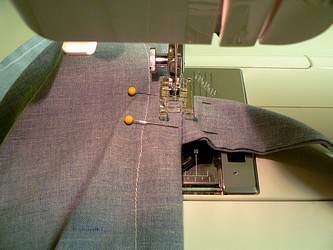 Line up the corners of your top seam, and adjust boning to the center as shown. Notice how the strap is positioned on one end of the boning panel. You'll add the snap to the opposite end. Stitch the channel closed at both ends of the boning to hold it in place. 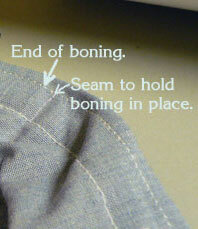 There is no need to stitch through the boning in this step. Thread overall clip onto strap. On the opposite end of the boning panel, press button stud up from the back through all the layers including the boning. Notice how this mama has the peek-a-boo 'window' (the top hem) pressed flat for extra privacy. wonderful homemade baby gift ideas!